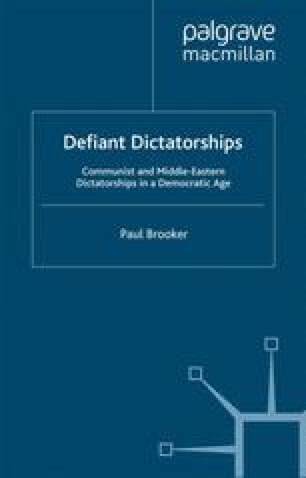 The wave of democratisation that swept through the Communist world and Third World in the 1980s and early 1990s did not eliminate all the dictatorships – some survived the onset of a democratic age.1 (By ‘dictatorship’ is meant a regime that is not a democracy nor a monarchy, and by ‘democratic’ is meant freely competitive, regular elections for public office.) Among the most prominent examples of dictatorships which survived into the mid-1990s were the four remaining Communist regimes of any significance, namely China, Vietnam, North Korea, and Cuba, and also four well-known Middle Eastern regimes: Baathist Syria and Iraq, Qadhafi’s Libya, and Khomeinist Iran. These eight dictatorships had avoided even the façade of democratisation involved in setting up semi-competitive multi-party elections to reconfirm the regime party and/or leader in power.2 Nor had their defiant refusal to democratise forced them to reshape their dictatorship. There had been no parallel to Communist Poland in 1981 and socialist Burma in 1988, when resistance to popular pressure for some democratisation had led to not just a change in the regime’s leadership but also a shift to open militarisation and rule by a military junta, respectively the Military Council of National Salvation and the State Law and Order Restoration Council.